How playback for sound effects and recorded music has evolved. 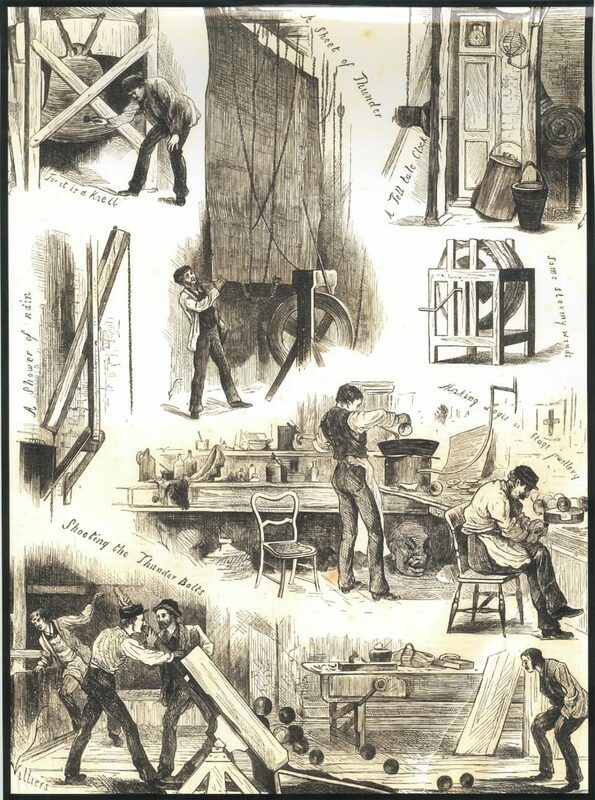 Before electricity came along, sound effects were created live, using a variety of ingenious methods. Ceramic (and later plastic) device which produced a convincing high-pitched whistle / warble when blown into. A bird whistle that may have been used in the original production of Romeo and Juliet was discovered on the site of The Curtain theatre in London in May 2016. A wooden box with some broken glass or broken crockery which is dropped / rolled around offstage. A wooden box with a hinged lid, fitted with door handles and a lock, which can be slammed offstage to sound like a full size door. A series of sprung wooden plungers controlled by a rotating cam fall onto a wooden box and produce a loud thud – used in pantomime productions of Jack and the Beanstalk for the approaching giant. 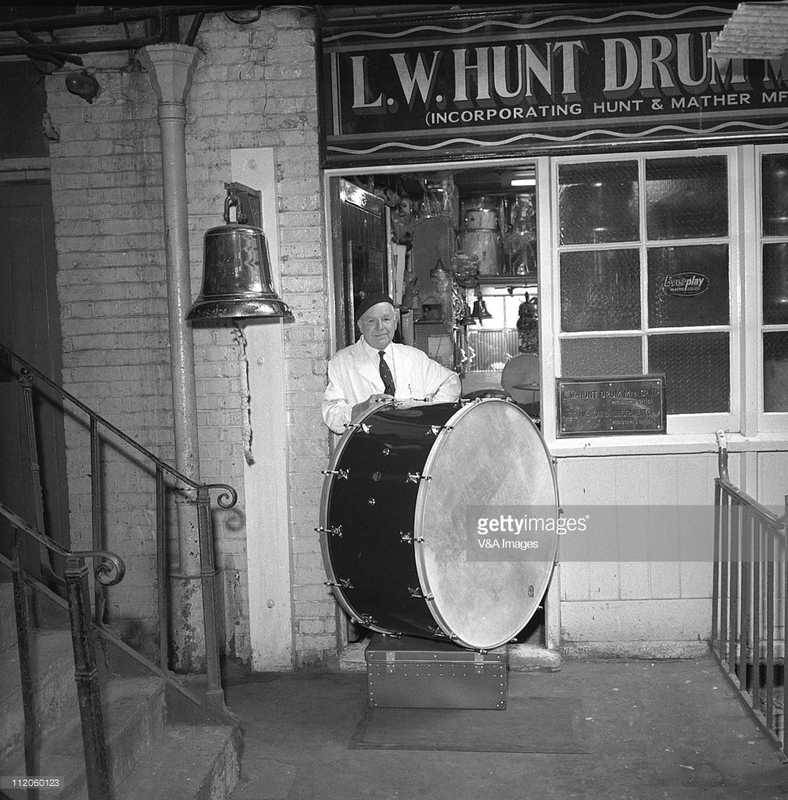 Len Hunt of the L.W.Hunt Drum Company provided drums of many types, and effects including the classic coconut halves for horses hooves. 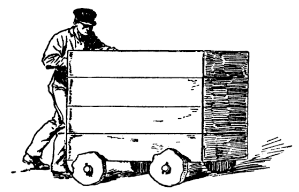 Wooden box (around 6 feet long, 4 feet high and 3 feet wide), mounted on heavy duty irregularly shaped wooden wheels. The box is filled with heavy material, and is pushed around in the wings, to create a loud sustained rumbling. A large wooden frame, covered with a tight drumskin, with a stick with one end covered with chamois. Wooden cannonballs are run through wooden channels above the auditorium ceiling, producing a highly effective combination of sound and vibration. There are 3 theatres in the UK which still have Thunder Runs – the Bristol Old Vic, Her Majesty’s Theatre in London and the Playhouse Theatre in Charing Cross, London. A suspended metal sheet (around 2m long and 1m wide) has handles fixed to the bottom of it enabling it to be shaken, producing a rumble. An experienced thunder sheet player can produce a wide range of types of thunder. A sealed wooden drum containing lentils or rice has a slatted interior surface which, when rotated vertically, agitates the contents, producing an evocative sound. After the advent of electricity, sound was far slower to evolve than lighting. The first theatre to be lit by electric light was the Savoy in London in 1887. Early radio drama makes use of mostly live sound effects and music played in the studio. 1947 – Modified Panotrope (twin gramophones with built-in amplifier) used for playing back sound effects. The system was designed and initially supplied by R.G.Jones of Morden. The company still exists, and has a great section on their history. RG Jones first became involved with the theatre after seeing a show at the Kings Theatre in Hammersmith. Post-war, money was very tight; so he purchased a seat in “the Gods” from where he had great difficulty hearing the actors. This got him thinking and he soon returned to the theatre to put a proposal to the management. He convinced them that with a microphone and a few loudspeakers, he could make the actors voices carry right to the back of the gallery. Thus came about one of the earliest speech reinforcement systems. Recommendations followed and soon RG Jones found himself in the theatre business! The company diaries show that equipment was then supplied to seven other West End theatres. To handle sound effects, RG designed and manufactured a device called the Panatrope. This was a beautifully engineered piece of equipment with specially designed cueing devices for the two 78 rpm turntables. Each pick-up arm was held in place over the record by means of an electro-magnet. This was attached to a rod which, in turn, was fixed to the groove locating mechanism adjusted by mean of cue bars. Each bar had a screw collar and was dropped into a slot in the mechanism. Moving the collar altered the position of the rod with the electro-magnet holding the pick-up. When the correct groove was located, the collar could be locked off with a screwdriver and was thus set for the start of the effect. When the “go” button was pressed the power to the electro-magnet was switched off allowing the pick-up to drop on the record. Who knows what RG would think of the SpotOn software that is now used by our engineers? 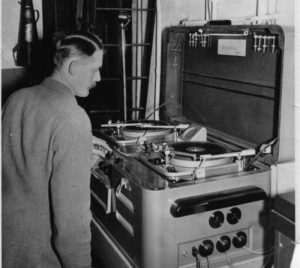 In the same year, Bishop Sound & Electrical Co. had supplied 3 sets of twin turntables and a microphone for the first London production of ‘A Streetcar Named Desire’ in 1949. Stage Sound also supplied systems. 1952 – Gramophone playback was in common use, made possible by machines such as the Sound Console by Strand Electric. Plenty of information about this era in David Collison’s The Sound of The Theatre book. Highly recommended. 1961 – Uher Report 4000 released – used by film, TV and radio professionals and for recording theatre sound effects. 1977: Revox B77 launched and used in many theatres for playback. BBC Records publishes an iconic range of sound effects vinyl discs. Tape Cartridge machines (e.g. Sonifex Cart Machine) used in radio stations also found use in theatre sound playback. 1988 – CD-R specification is published, enabling CDs to be created by end users. 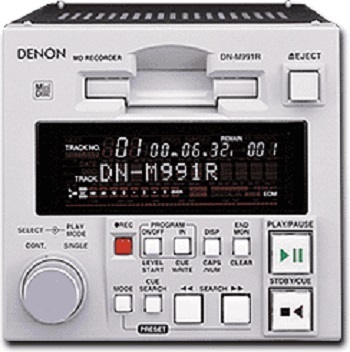 However, the first CD Writers (such as the Meridian CD Publisher, based on the Yamaha PDS Audio Recorder, cost $35,000 plus a computer to run it). The first recorder under $1000 was launched by Hewlett-Packard in September 1995. In the early days, UK sound designers had to send master tapes to a mastering studio in London, wait a week or so, and pay around £250 to get a digital copy of their tapes. BBC Sound Effects are published on CD. 1990s – Akai S1000 and other samplers available for sound designers to store high quality digital samples, and control the playback using a variety of MIDI devices, including control software such as G-Type. 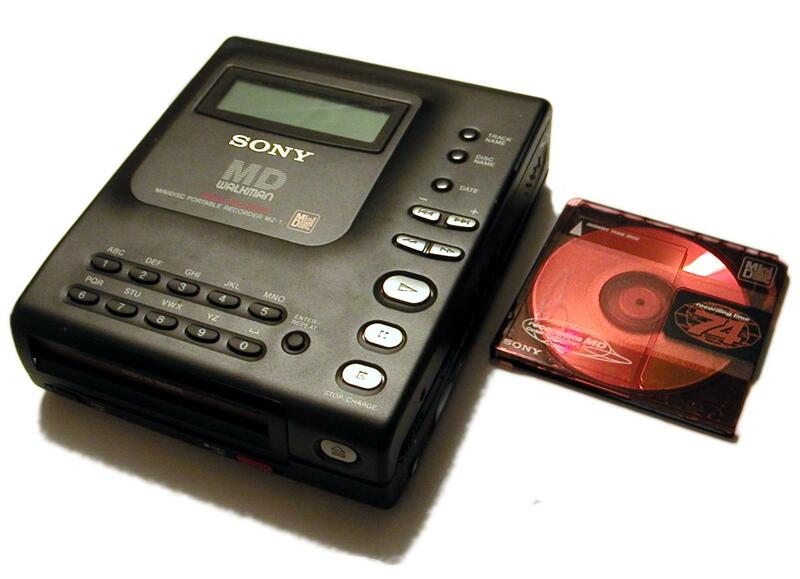 1992 – MiniDisc (Sony) – replaced reel to reel tape almost overnight in many theatres. Still used in radio studios long after it ceased to be a consumer product. 1992 – DCC – Digital Compact Cassette – not adopted for theatre because although it was very good quality, access to tracks took time as the tape had to be wound forward / backwards, whereas MiniDisc was instant access. 1998 – The internet brings with it instant access to hundreds of thousands of sound effects, at the click of a mouse and payment of a small fee. Computer-based audio playback became more reliable with each new operating system and as storage prices drop, becomes affordable, and a sensible replacement for disc-based (either CD or MiniDisk) playback. Digital recorders bring high quality recordings within the reach of every sound designer. Ableton is used by sound designers and composers to create soundscapes. QLab continues to dominate in the professional and amateur fields. 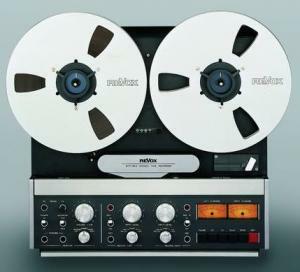 Reel to reel tape was the only medium used for most playback in theatres for 20 years. The tape was played at 7.5 inches per second (7.5ips), so long lengths of tape were used for even the shortest effect. Find piece of music on vinyl record or on compact disk (1983 onwards). If the vinyl record isn’t in the theatre, find it in a record library or order it from a record shop. Wait a few days for it to arrive. Play the record or compact disk on a suitable player while recording to reel to reel tape. Stop playback and recording devices. Using chinagraph pencil, mark the end point and start point of the sound effect or piece of music on the bottom side of the tape, by listening through the tape and winding it back and forth by hand to find the exact point. Release the tension on the tape by gently winding the reels in opposite directions. Place the tape (brown side down, black side up) in a metal splicing block, so that the start point is on the cutting groove. Cut the tape using a single sided razor blade. Cut a short length of clear leader tape (around 4cm) on the splicing block. Lay this next to the start of the sound recording. Cut a short (1cm) piece of splicing tape (adhesive) and use the razor blade to place it across the join. Smooth the tape down using a cotton bud. If this is the first cue of the show, use a long (60cm) length of green leader tape and splice this to the clear leader tape. If it’s not the first, use a 20cm length of yellow leader tape. Wind the effect onto the right hand reel of the reel to reel recorder, until you reach the end of the sound effect. Cut the tape on the splicing block. Splice on around 30cm of yellow leader tape (between effects). Repeat for all sounds / music / recordings in the show, adding in tape from other recording sessions (e.g. voice recordings) as necessary. Time taken: Around 5 minutes editing / splicing time for each recording, plus the length of the recording, which has to be made in real-time. Extending a piece of music: Copy the piece of music from the source device (CD or Vinyl) onto tape the required number of times. Find the point where you want the extended section to start on the tape, and make a mark on the bottom side of the tape with a chinagraph pencil. Make the tape slack by winding the reels inwards, and place the marked part of the tape in a splicing block. Make a cut using a single-edged razor blade. Repeat for the next section of music on the tape, and splice the two ends together. Listen back and see if it sounds OK. Remove the splicing tape and make adjustments if necessary. If you’ve cut too much off, you may have to start again. Time taken: Up to an hour, depending on the complexity of the music and the number of edits required. Looping a recording: Record the effect or music onto a piece of tape. Mark the start and end points with chinagraph pencil. Make the tape slack by winding the reels inwards. Make diagonal cut at the start and end. Bring the start and end points together on the splicing block and join them with splicing tape. Remove the reels and place the tape through the reel to reel recorder, so that the capstan wheel pulls it through. The rest of the tape loop should be carefully hooked around anything in the studio that will support it without causing it to stick. Smooth surfaces are best (e.g. bottles). Press PLAY on the tape machine and listen to the loop. If it sounds OK, connect the playback machine to another reel to reel machine and copy the resulting loop for the duration that you need it during the show. Time taken: Around 30 minutes, again, depending on the length of the track.